We’ve all heard the phrase, “Necessity is the mother of invention.” If you’ve shot guns long enough, you’ve likely encountered a dirty magazine that had fallen to the ground or into mud and water. Of course, the debris that enters a magazine can work into the pistol’s action to produce a malfunction or even damage the firearm. The solution is simple, and Ammo Armor’s new sleeve is one of those products that makes one think, “I could have invented that!” But you didn’t, and now there’s a patent pending. 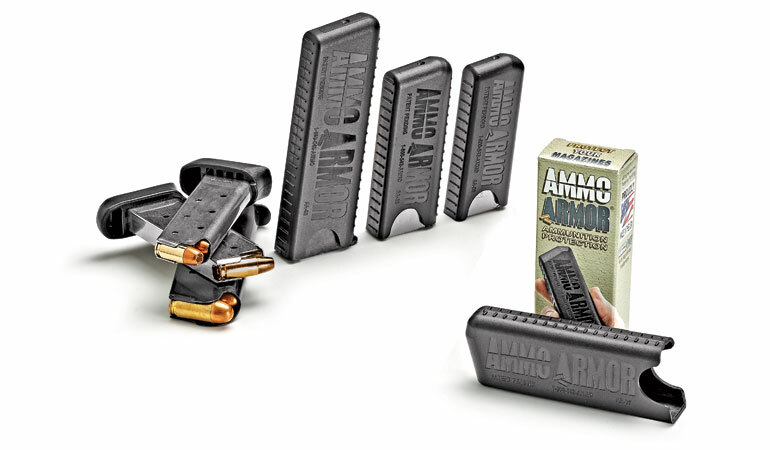 Ammo Armor is a cover for pistol magazines that is made of polyethylene, a high-end plastic that feels high quality. Polyethylene is resistant against the use of aggressive cleaning solvents as well as heat. These are dustproof, impact resistant and water repellent to protect the operation of a magazine that’s not in use. If a magazine is dropped onto dirt, would you not think about cleaning it before putting it into a gun and trying to shoot from it? G&A has found several other great uses for Ammo Armor. Consider the magazines stored in the console or glove box of a vehicle. Ammo Armor’s covers even protect spare magazines haphazardly thrown into a range bag. (They don’t have to be loaded to need protection.) Besides the random debris that already exists inside any given bag, we’ve found that Ammo Armor also protects the feed lips on a magazine. If you’ve ever tried using magazines with bent feed lips, you know it’s difficult to trust the reliability of the suspect mags. Ammo Armor can be used to guard spare magazines from lint when carried in a pocket. With the magazine drawn, these covers are easy to pull off quickly. There’s even a U-notch designed at the base of each cover to provide additional purchase for pinching the baseplate of a magazine and pulling the magazine and Ammo Armor apart. Many Ammo Armor covers work with other magazines with similar profiles. However, there are magazine-specific covers. Find the right Ammo Armor cover engineered to fit your magazines at ammo-armor.com.